There are six amazing golf courses at the Reynolds Plantation Golf in Greensboro, Georgia. The six championship layouts designed by some of the greatest names in the business: Rees Jones, Bob Cupp (2), Jack Nicklaus, Tom Fazio and Jim Engh. Of the six, five are available for play the year-round which, together with the on-property Ritz Carlton Lodge, make the Reynolds Plantation one of the premier golf destinations in the world. Rees Jones designed the Oconee Course. It was completed in 2002 and has created quite a stir among the golfing community. The layout is a true resort course with little evidence of the surrounding real estate developments: the fairways are lined with tall pines and hardwoods that provide a quite and seemingly remote environment. The course plays some 7029 yards from the tips for a par of 72, a rating of 73.4 and a slope of 136. Six sets of tees )four for the men and two for the ladies) make the course friendly to players of all levels of skill. For three years, 2003 through 2005, GOLF FOR WOMEN Magazine listed the Oconee number five in their annual ranking of the "50 Best Courses For Women." They say that no great golf resort would be quite complete without a Jack Nicklaus signature course. Reynolds Plantation boasts the Great Waters Course which Jack completed in 1992. Ranked among the "Ten Best New Courses" by GOLF Magazine, the layout plays 7,073 yards from the back tees for a par of 72, a rating of 73.6 and a slope of 133. Eight sets of tees (four for men and four for women) offer an unusual, but decidedly player friendly, set of options for play. Reynolds Landing is one of two Bob Cupp courses at Reynolds Plantation. 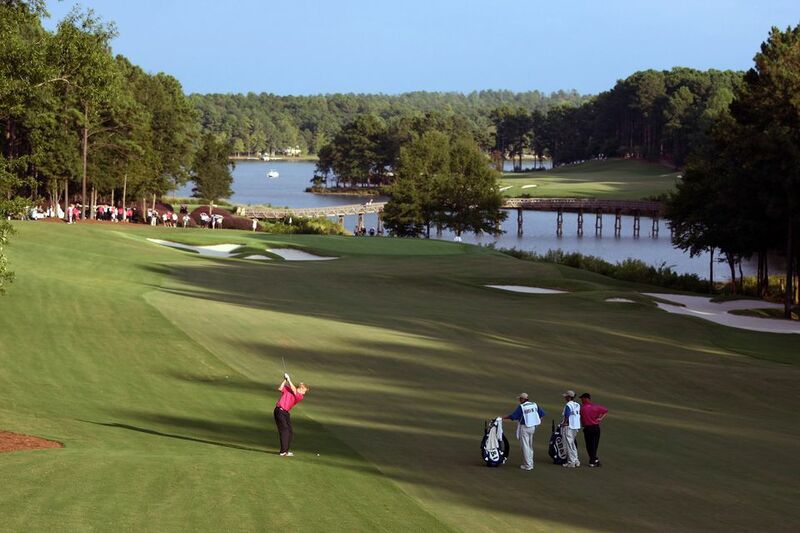 More a real estate layout than a resort course, it does offer its own unique set of challenges, not the least of which are the seven holes where water is in play: two on the shore of Lake Oconee itself. The course plays 7,048 yards from the longest tees for a par of 72, a course rating of 74.4 and a slope of 138. Cupp included six sets of tees (three for men, one for women and two mixed) to ensure a fair test for golfers of all skill levels. "Reynolds Landing is the hidden gem of Lake Oconee. Bob Cupp's architectural genius was unveiled to the golfing world during the construction of Reynolds Landing. From the masterful green settings to the challenging shots played around beautiful Lake Oconee, Reynolds Landing is clearly one of Georgia's finest kept secrets." Bob Mauragas - Vice President of Golf Operations. The Plantation is the second course at Reynolds Plantation designed by Bob Cupp, Completed in 1988, the Plantation was the first golf course at the Reynolds Plantation, and it set the stage for what was to become the golfer's Mecca it is today. The course is ranked one of "Ten Best New Courses" by GOLF Magazine, and Zagat's 2007 America's Top Golf Courses. It plays 6,698 yards from the tips for a par of 72 incorporating six sets of tees. Tom Fazio is the master of the game, and he took maximum advantage of all the opportunities offered by the site when he designed Reynolds National in 1997. The layout Fazio created is as dramatic as it is unique. Three nine-hole layouts make the National a unique course at Reynolds Plantation: the Ridge, the Cove, and the Bluff can be played in any combination of two to make 18 holes. Water plays a big part in the challenge of the national. Fazio, as always, has made his contribution a force to be reckoned with, whatever the combination you might choose. Tight fairways with tall pines and hardwoods, punishing doglegs, slick undulating greens, and water almost at every turn offer lots of risk/reward options that require accuracy and astute club selection. The closest major airport to the Reynolds Plantation is Atlanta Hartsfield International. The airport is served by Delta, Continental, US Air, United and just about every other national and international airline you can name. The Reynolds Plantation, 100 Linger Longer Road, Greensboro, Georgia 30642; phone 888-298-3119: Visit the Reynolds Plantation website. And don’t forget: There are many other opportunities for great golf all over the world. Favorite locations include Scotland, Florida, the American Southwest, Bermuda, the Bahamas and many more. For up-to-date golf travel news and information, be sure to Subscribe to my weekly Newsletter.